Hornby Trains Sets. Maximum height (level to level): 80mm. Sylvanian Familes. Tamiya RC Cars. Sylvanian Families. Plastic Model Kits. Scalextric Cars. Hornby R.654 Inclined Piers Set. Condition is New. Dispatched with Royal Mail 1st Class. 2 sets of piers in good condition. HORNBY R658 SEVEN INCLINED PIERS. Hornby R658 Set of inclined piers set-of-inclined-piers. Hornby R8014 Mark 2 Point Motor. Should these circumstances arise, we will notify you. PICK UP OPTION. © Hattons Model Railways. Price:£4.00. Buy now and save! Hornby R.654 Inclined Piers Set PRE OWNED UNUSED INSTRUCTIONS INCLUDED FREEPOST. Condition is New. BUILDS SEVEN SUPPORT BASES! MAKE THE HEIGHTS YOU REQUIRE Well packed and prompt dispatch UK only. Hornby Inclined Piers 2 sets 2 sets high level supports 00 gauge. Condition is Used. Dispatched with Royal Mail 2nd Class. Hornby Girder Bridge Complete With Two Sets Of Inclined Piers V.G.C. A hornby modern girder bridge complete with two sets of inclined piers (up & down) mostly new see photo’s thanks for looking. Hornby R658 7 inclined piers 00 Gauge accessories. 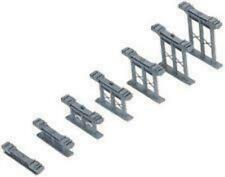 5 out of 5 stars - Hornby R658 7 inclined piers 00 Gauge accessories. 17 product ratings17 product ratings - Hornby R658 7 inclined piers 00 Gauge accessories. TRIANG HORNBY. A great item for your collection. 2 complete sets each of 7 Inclines as made in England = 14 inclines in total. Makes 2 sets of complete inclines (to and from bridge, banking etc). Clip fit for self assembly base and top piece. 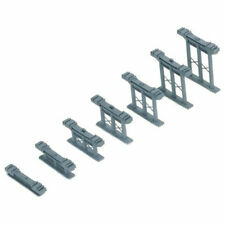 A hornby R657 girder bridge & 2 sets of inclined piers (used) see photo’s sold as seen thanks for looking.